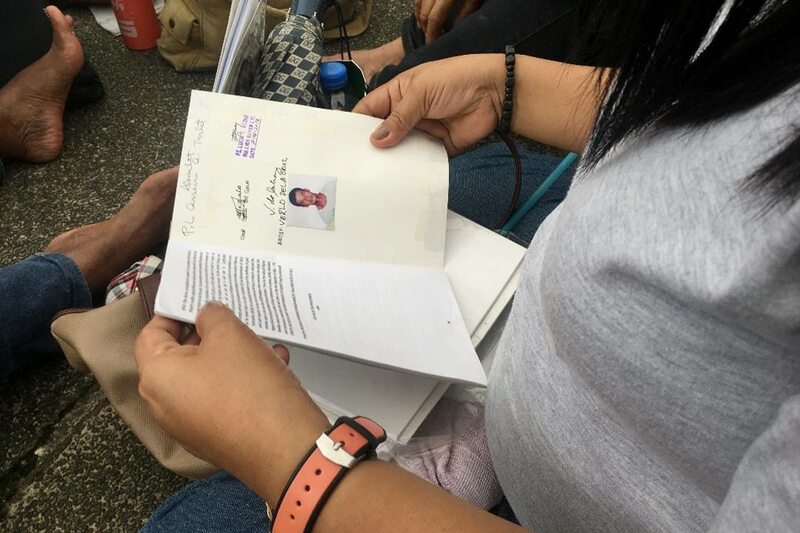 People who went to the UP Los Baños campus on Sept. 23 brought with them a pamphlet purchased for P30 produced by a group called Bullion Buyers Ltd. The pamphlet was a collection of propaganda materials on former president Ferdinand Marcos. Luis Liwanag, VERA Files. In the morning of September 23, 2017, the 45th anniversary of the actual declaration of martial law by former president Ferdinand Marcos, thousands gathered at the University of the Philippines Los Baños (UPLB) Freedom Park in Laguna. 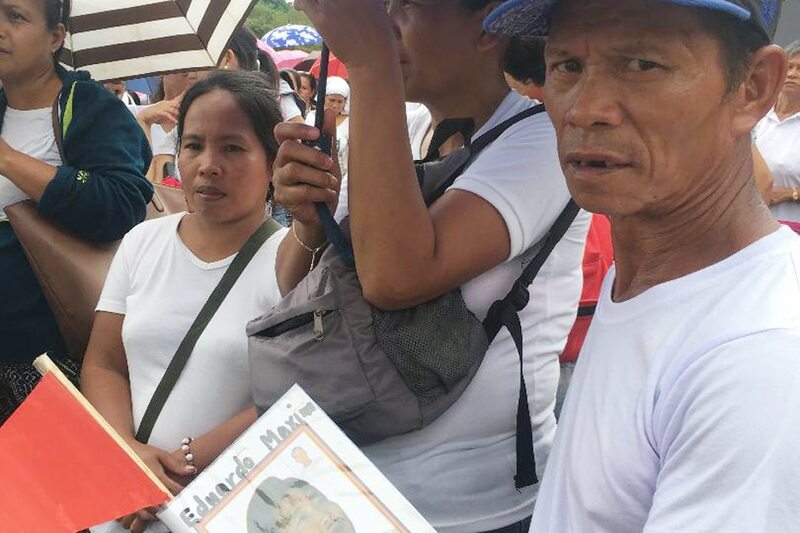 They said they came to collect the P10,000 they were promised every month for the next four years as claimants to their share of the Marcos wealth. The proof of their claim: a pamphlet purchased for P30, extolling Marcos for his "immortal legacy." Behind the pamphlet was an organization that had already been discredited by the Securities and Exchange Commission and whose leaders had already been charged with estafa by the National Bureau of Investigation way back in 2013. So what was this gathering all about? Was there a hidden hand and a hidden agenda that set this in motion? To find some answers to these questions, I go back to my hometown and to a story my mother told me. In the first week of December 2016, my mother attended a Christmas party at a beach resort in our town in Sorsogon. Taking place at the same resort was a bigger gathering of about 100 people. Nearing noon, someone from that group started praying over the loud speaker, prompting my mother to think that it was an evangelical event. But then the national anthem was played, signalling the start of a formal program. It was the next song, however, that jolted my mother’s memory: “Hymn of the Bagong Lipunan.” She knew the lyrics. My mother, 70 years old and widowed, said she used to hear it all the time over the radio during the martial law years. After singing the hymn, she said, a handful of speakers started praising the life and accomplishments of Ferdinand Marcos, talking about how the country did so much better during martial law. Through a friend who attended that program, my mother would learn that the speakers ended their event by convincing the crowd to provide details of their personal information and to buy a pamphlet, initially priced at P50, but later reduced to P30. Marcos, the speakers told the crowd, bequeathed his wealth to the Filipino people in his last will and testament. The Marcos family was planning to honor the patriarch’s will. But the wealth could not simply be distributed to anyone. Each person’s identity had to be verified. So the people present were told to fill up personal information forms and to submit copies of their voter’s ID, birth certificate, marriage certificate, driver’s license, or any such document that could prove who they are. With the pamphlet and their verified personal information, they would be entitled to an outright grant of P50,000. Those gathered at the resort were asked to refer other interested beneficiaries. Designated coordinators handled the filling up of forms, the sales of the pamphlets, and the gathering of photocopies of the required documents. My mother later learned that the group that organized the event went by the name Bullion Buyer Ltd. or BBL. I eventually got hold of the pamphlet that belonged to my mother’s friend, who lent it to me with a caveat that should the promise of a bounty be true, I was to return it to her and we would split the promised amount. She herself is quite sure now that it was a scam, but she spent a mere P30 on it anyway, the cost of less than a jueteng bet. 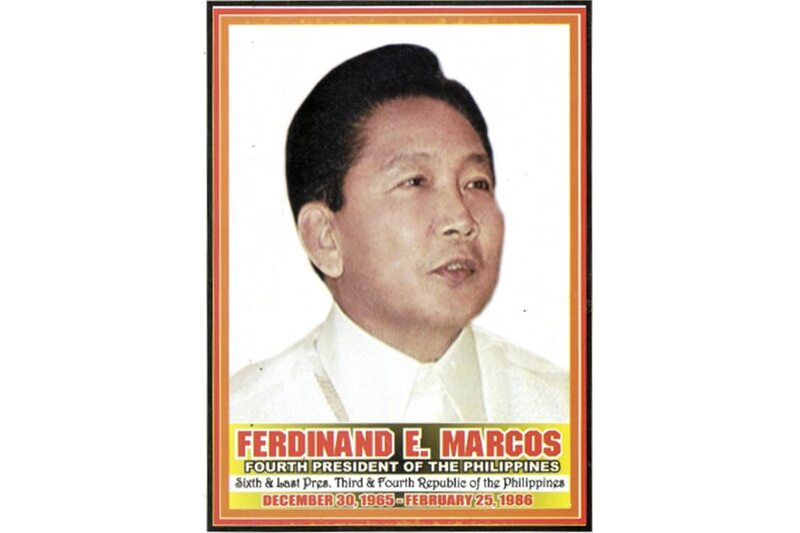 The cover of the 30-page pamphlet is a portrait of Marcos in full color. 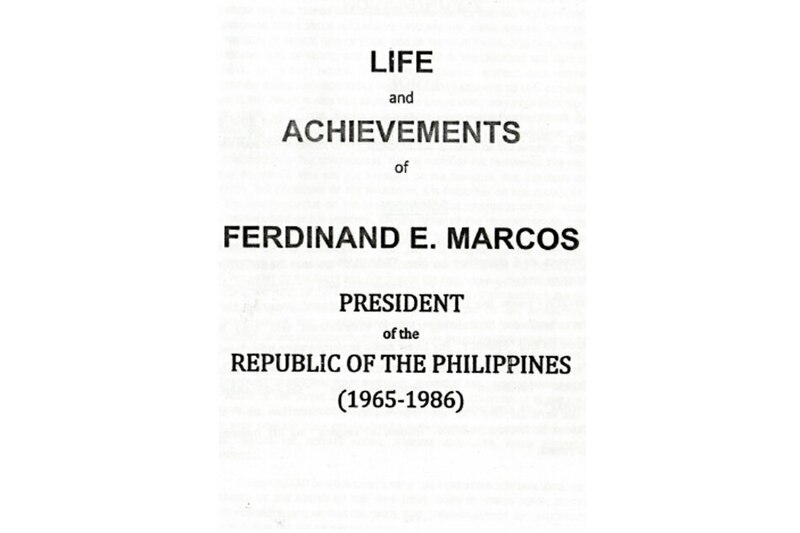 The first page of the pamphlet bears its supposed title, "Life and Achievements of Ferdinand E. Marcos, President of the Republic of the Philippines (1965-1986)." The back cover is a copyright claim: Bullion Buyer Ltd, copyright 2016. In my copy, the first page contains the name of the coordinator from whom the pamphlet was bought, and the participating leader the coordinator reports to. Stamped on the upper right hand corner of the first page is the name of the member of the national inspectorate to whom the participating leader reports. The organizer of the gathering at the UPLB is called One Social Family Credit Cooperative. According to one former member, BBL’s founding date is Sept. 11, 2011, Marcos’ birthday. The supposed first organizational meeting was held at Max’s restaurant in Parañaque. Imelda Marcos was supposed to have graced the occasion had a typhoon not stood in her path. There is even an online video clip of the meeting where two persons spoke. They were identified as “Red Dragon” and “Pink Diamond,” supposedly the pseudonyms of founders Emmanuel Destura and Felicisima Cantos. Destura and Cantos went into hiding after a charge of syndicated estafa was filed against them in 2013. Destura is said to be a son of Pedro Destura, a mayor of Prieto Diaz, Sorsogon from 1969 to 1971. The younger Destura claimed that Marcos entrusted to his father a still undetermined tonnage of gold deposits in Switzerland. Emmanuel Destura surfaced at Los Baños yesterday, this time identifying himself as the chair of the One Social Family Credit Cooperative. 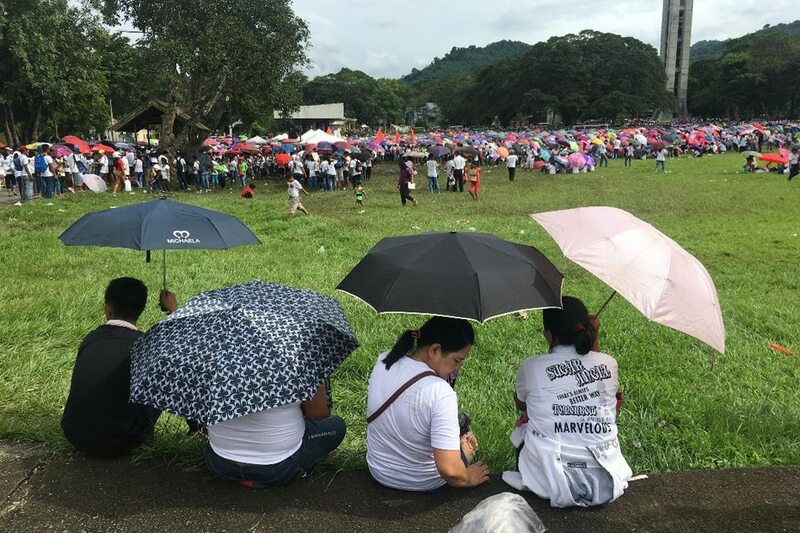 Thousands gathered at the University of the Philippines campus in Los Baños, Laguna on Sept. 23, supposedly to collect their share of the wealth amassed by former president Ferdinand Marcos. Luis Liwanag, VERA Files. The continuing presence of BBL in various parts of the country prodded the Securities and Exchange Commission to issue an advisory on April 6, 2017 warning all local government authorities that the company is unregistered, and that its modus operandi violates the Securities Regulation Code. From the syndicated estafa charge sheet, it appears that the group’s modus operandi is rather straightforward. The initial recruits were tasked to organize events in the different localities in the country and were initially called participating leaders. They also had to pay the organization P2,000. They were told they would be prioritized once the Marcos wealth is distributed. In exchange for their contribution, they would first receive P1 million and then 30 days later, $1 million. Not one participating leader was ever paid a centavo, much less the millions of pesos and dollars promised. Some of these disaffected participating leaders were the ones who brought the charge of syndicated estafa against the leaders of BBL in 2013. The sale of the Marcos pamphlet is a recent addition to the modus, and may have shifted the dynamics within the BBL. 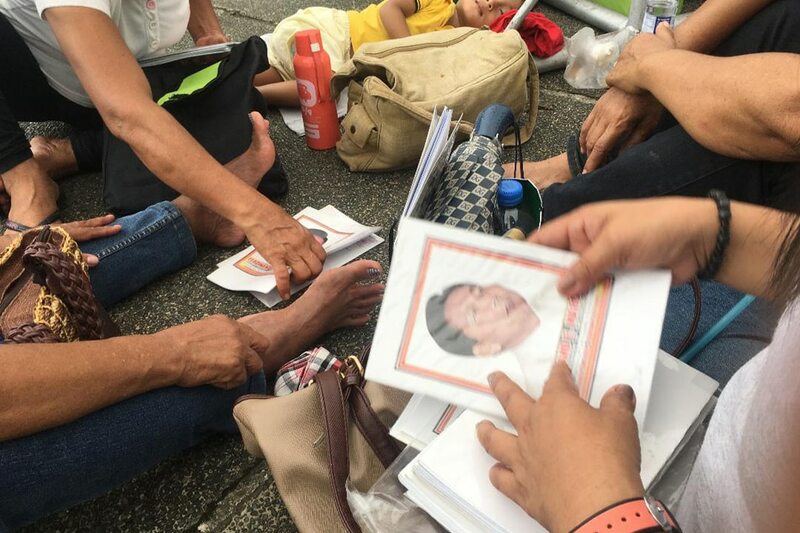 The participating leaders may have managed to find a way to recoup their contribution while waiting for the millions of pesos and dollars supposedly due them by selling the pamphlet. “President Duterte cannot do all his good plans for the country without unity. Can we now blame President Duterte if he declares Martial Law in the future if that is the only way in order to achieve peace, unity and prosperity,” the pamphlet continues. Quite coincidentally, Duterte announced less than a month ago that the Marcoses were willing to return the wealth that rightfully belonged to the Filipino people. “The Marcoses – I will not name the spokesman – said that they'll open everything and probably return those that had been discovered,” Duterte said. So what does that UPLB gathering have to do with anything? In 2004, unnamed publishers reworked an undated, earlier edition of a compendium of Marcos propaganda entitled "Let the Marcos Truth Prevail." The 2004 publication bore the same title, was 855 pages long and distributed for free to various public schools and universities, mostly in the provinces. In the online catalogues of some universities, the bibliographic entry for this book cites Imelda Marcos as the author. 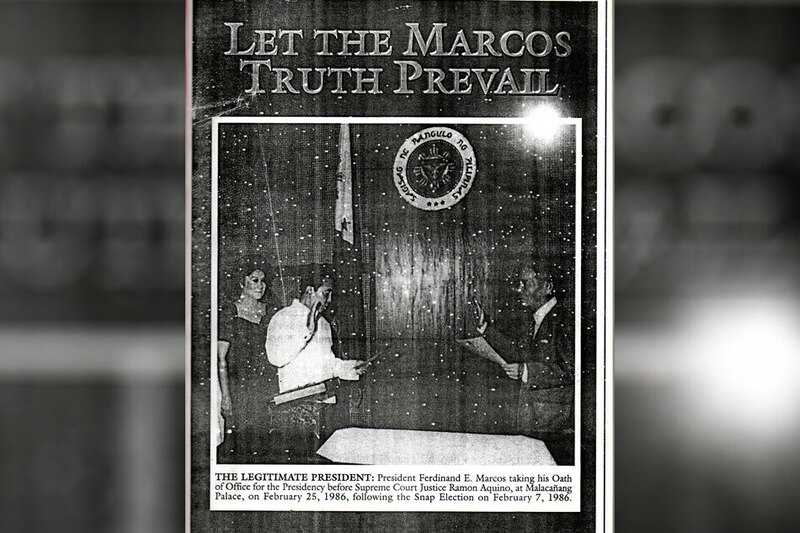 Photocopy of the cover of an 855-page book titled Let the Marcos truth prevail distributed to different universities all over the country. The publication had neither author nor editor, neither date nor publisher. Authorship could only be inferred, as the book had neither author nor editor. And as is common in Marcos propaganda material, there is also no stated date of publication nor a publisher. But it contains scanned copies of Imelda’s checks as a widow of a war veteran, material that cannot simply be found in public records. The presence of the check strongly suggests that the Marcoses had direct knowledge in compiling and publishing "Let the Marcos Truth Prevail." Also, a journalist from the Marcos crony press known for her closeness to Imelda Marcos distributed copies of this book to those who were interested. The BBL pamphlet is an abridged version of this compendium. Pages 5 and 6 of the pamphlet mention Ferdinand Marcos's record of military service and the honors he received, many of which have been proven to be mere fabrications by Marcos. The entry is just a retyped version of a March 4, 1996 certification from the General Headquarters of the Armed Forces of the Philippines (AFP) regarding Marcos’s military service. The one who encoded the certification from the AFP into the pamphlet was so faithful to the AFP text, even copying the line breaks from the original. This AFP certification that is in both the pamphlet and the compendium lately resurfaced in the most unlikely of documents: the submission to the Supreme Court of Solicitor General Jose Calida arguing for the burial of Marcos at the Libingan ng mga Bayani. Annex 13 of Calida’s Consolidated Comment on the case bears an odd pagination: 165. The Consolidated Comment is only 159 pages long. Page 165 comes from "Let the Marcos Truth Prevail," the book that the Solicitor General used in arguing for the burial. This is literally the Solicitor General taking a page from the Marcos playbook. In his submission to the Supreme Court, the Solicitor General did not bother to secure another certification from the AFP regarding Marcos’s military record nor did he have it authenticated. He merely submitted a photocopy of a page from "Let the Marcos Truth Prevail." Not one of the oppositors in this case noticed it, not even the justices. What we have then are replications of texts that carry the untruths of the Marcoses. In each and every replication, the Marcos myth survives and is passed on. The case of Bullion Buyer Ltd., and its new iteration One Social Family are instances of the trafficking in historical fraud. Through the pamphlet, Filipinos, often the poorest and most marginalized among us, are induced to literally buy into the Marcos propaganda. In the case of the Solicitor General, such fraud, like Marcos being the recipient of so many war medals, has now found its way into our jurisprudence—a Marcos myth attempting to pass itself off as established fact.